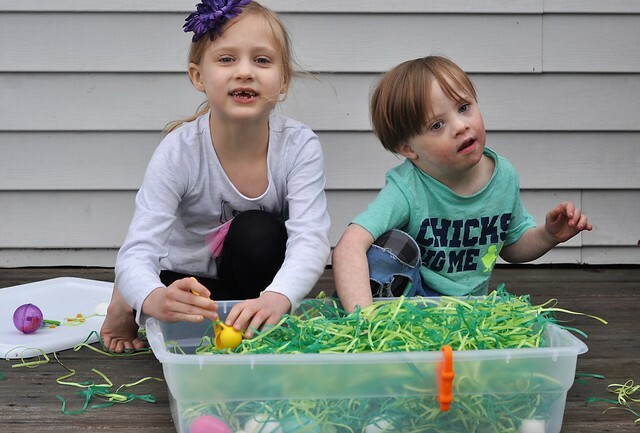 Liam and Lily love sensory bins! 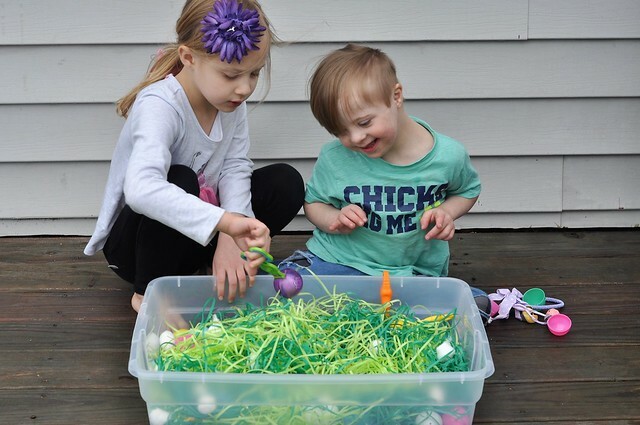 We have a big collection of sensory bin fillers, and I try to rotate through themed bins twice a month. 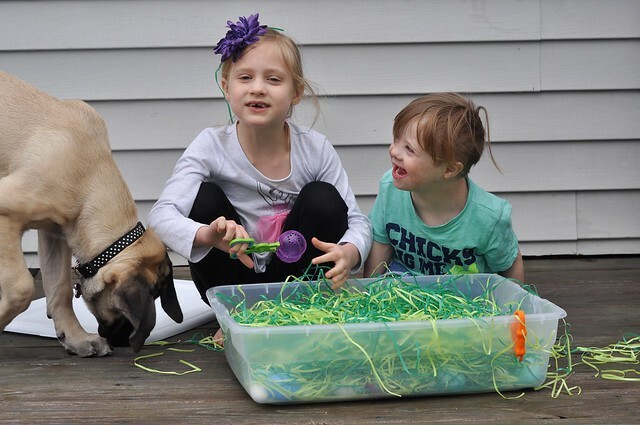 Sensory play is my secret weapon for those inevitable "I'm bored" moments! 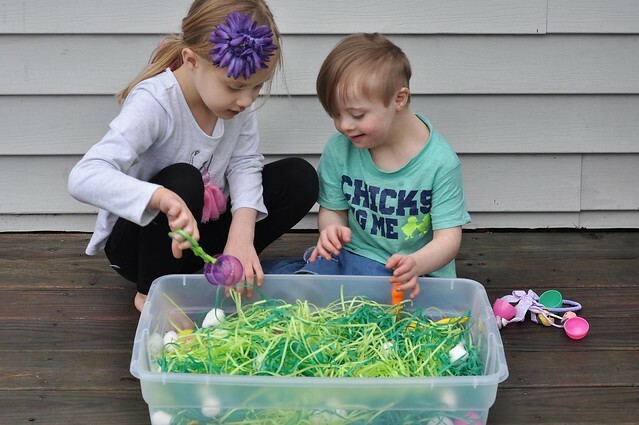 Our current Sensory Bin encourages egg-cellent Easter sensory play! 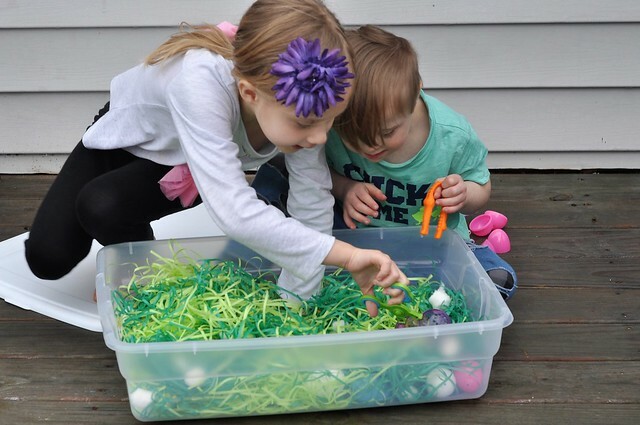 Sensory bins can be overwhelming at first, because there are so many options, but they are actually an easy and inexpensive form of sensory play. The possibilities are truly endless, the fillers are usually very cheap, and storage is a breeze! The best part is that kids LOVE them! 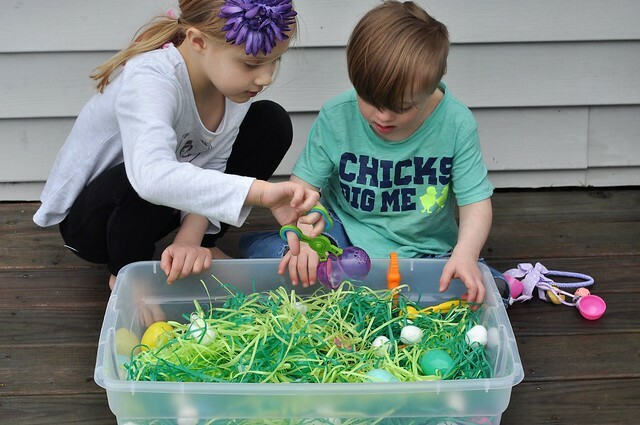 With the help of a few Easter-themed fillers, an ordinary sensory bin can be transformed into a festive play spot for kids. 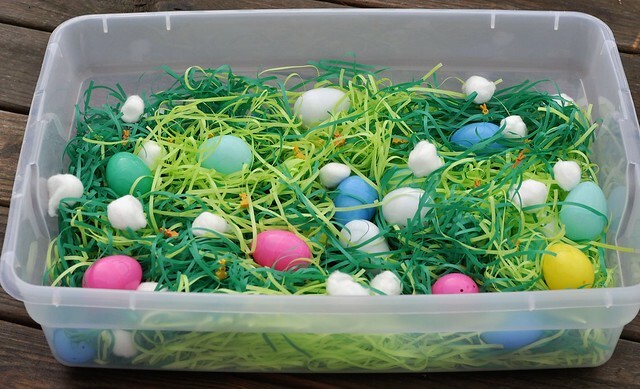 And if you already have the basics, this egg-cellent sensory bin only costs $6 tops, and the fillers can be stored away for later use! 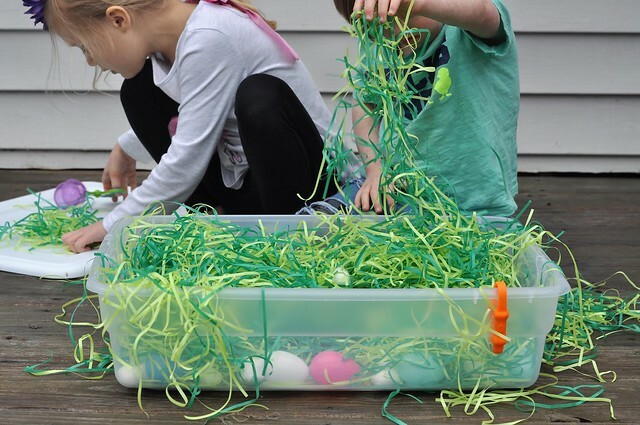 This adorable Easter-themed sensory bin is filled with Easter Eggs, Easter Grass, bunnies, and cottontails! 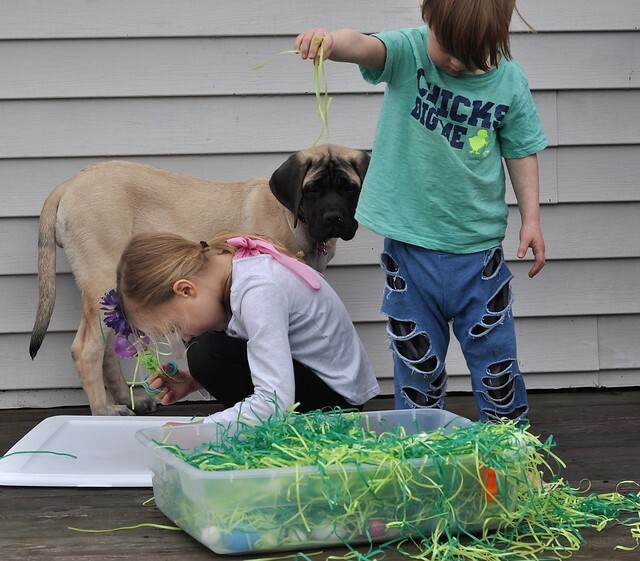 Dig through the Easter Grass to find the mini bunny erasers. 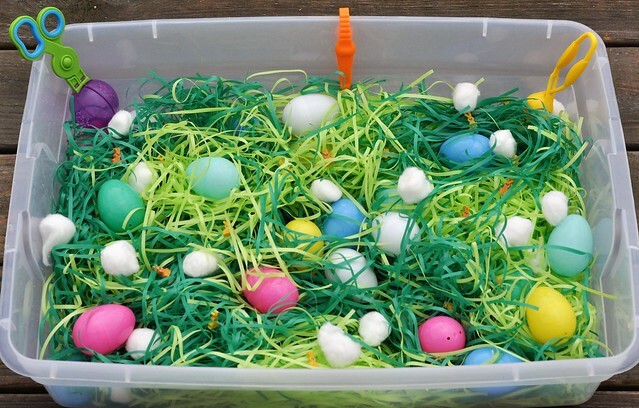 Pick up the Easter Eggs or the cotton balls with the large scoopers. Pick up the bunny erasers with the small scoopers. 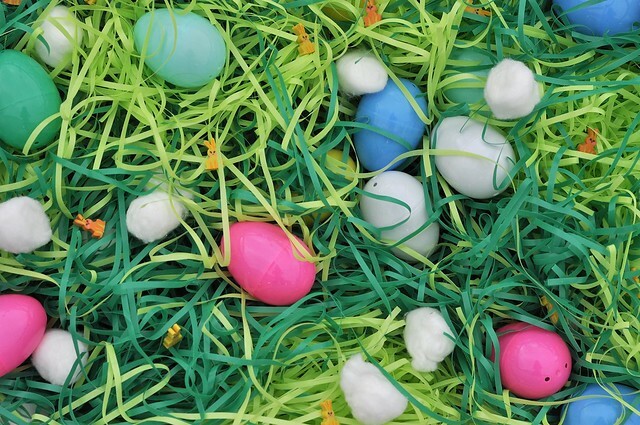 Pick up the cotton balls or the bunny erasers with the tweezers, and transfer them to an Easter Egg. 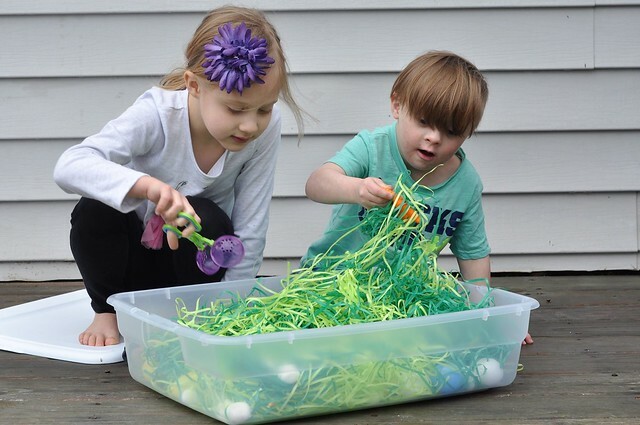 Transfer the bunny erasers to an Easter Egg with the tweezers or scoopers, close the egg, and shake it to make a maraca. 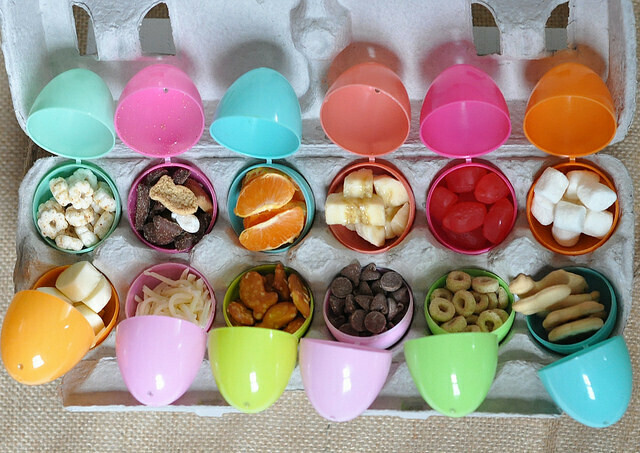 Separate all the Easter Eggs, mix them into the bin, then put them back together by color or come up with your own mismatched combos. 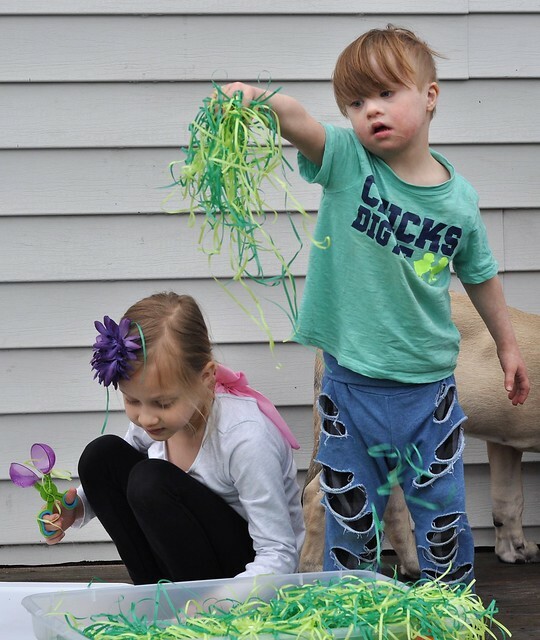 Separate all the Easter Eggs, then stack the pieces up to make a tower. 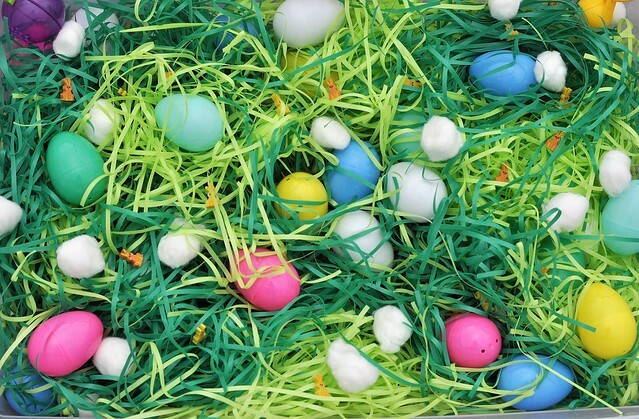 Use the large grabbers to pick up the Easter Eggs and place them in the egg dying cup of the same color. 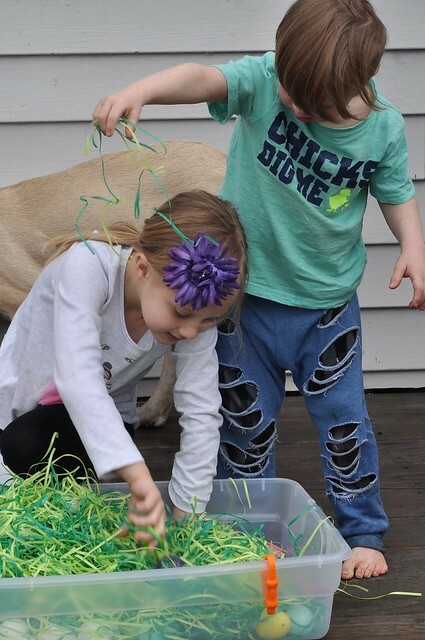 Just dig through the grass, explore the different textures, and have fun! Stimulates the senses of touch, hearing and sight. 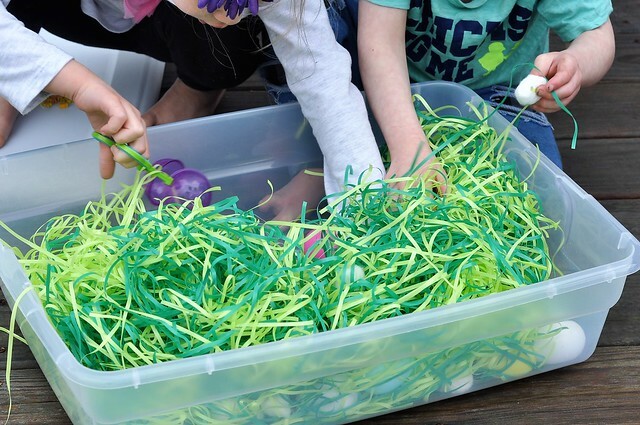 After play is over, separate the fillers, then place each item into individual plastic or reusable storage bags. Place the bags into the storage box, put on the lid, and store the box. Super easy and convenient! 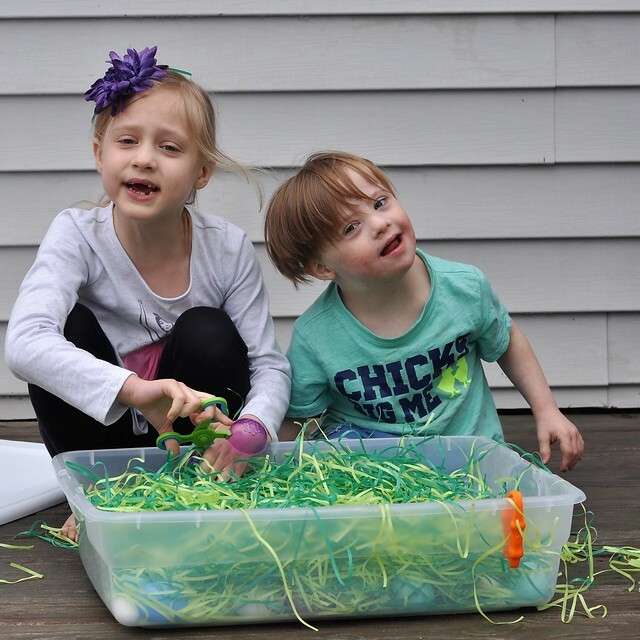 If that's not enough to convince you to make a sensory bin for your little ones, perhaps Lily and Liam can show you just how fun and rewarding sensory play can be! 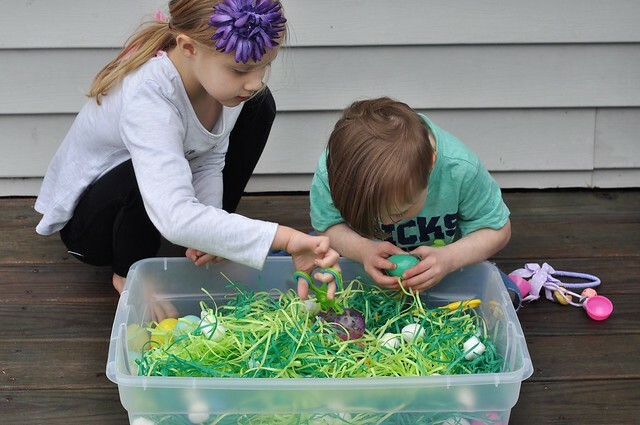 This Easter-themed sensory bin is a cinch to put together! It's likely that you already have most of the items that are needed in your home. 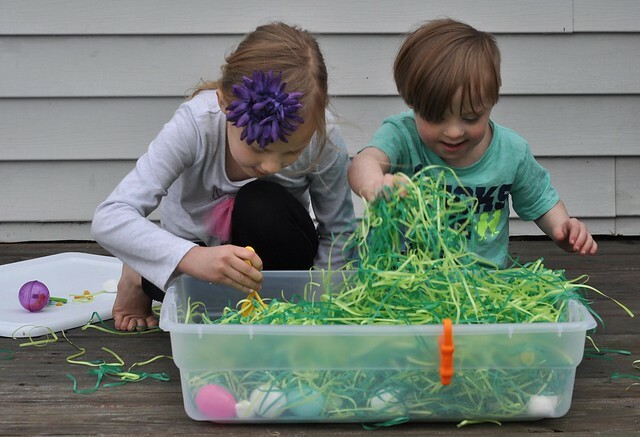 It's so much fun to celebrate holidays with kids, and using this egg-cellent sensory bin is such a fun and beneficial way to celebrate the upcoming holiday! 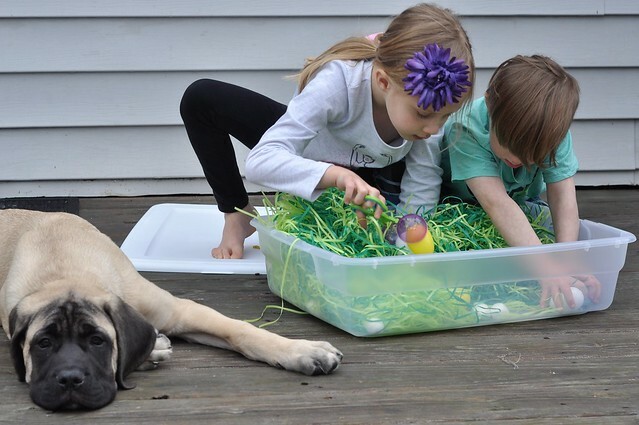 Watch your puppy doesn't eat any of that!